Since 2004, the Fellowship has adopted six statements of conscience that express the congregation’s official position on important social justice issues. 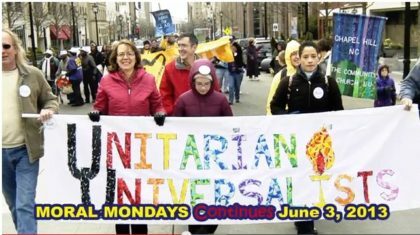 We, the Unitarian Universalist Fellowship of Raleigh, affirm justice, equity and compassion in human relations, and the inherent worth and dignity of all persons. In the absence of this right to marry, we resolve to oppose any law, policy, or practice that limits the recognition of same-gender couples’ relationships and families and any related rights and protections. We are especially called to oppose any attempt to enshrine such discrimination into the North Carolina constitution. We further resolve that we will respect and protect same-gender couples and their families by raising awareness of the discriminatory effects of any proposed laws or constitutional amendments. We will also take specific actions to defeat such laws or constitutional amendments. We, the Unitarian Universalist Fellowship of Raleigh, affirm our shared respect for the interdependent web of all existence. We acknowledge that human behavior has led to the deterioration of Earth’s natural resources. Therefore, we resolve to adopt and promote sustainable practices as part of our religious faith. We define such practices as those that serve to protect, preserve, and restore the natural resources of our environment. We further resolve that the Unitarian Universalist Fellowship of Raleigh supports the enactment of laws, policies and practices at all levels of government that serve to encourage and, where necessary, require protection of our shared environmental resources. We, the Unitarian Universalist Fellowship of Raleigh, affirm the inherent worth and dignity of every person, and the principle that justice, equity, and compassion must guide human relations. In keeping with this affirmation, we hold that access to health care is an inherent human right and that the denial of this right, actively or by omission, is morally unacceptable. Therefore, we resolve to promote the enactment of laws, policies, and practices at all levels of government that provide access to health care for all people. We further resolve to support programs designed to provide health care services to those in need. We, the membership of the Unitarian Universalist Fellowship of Raleigh, affirm the inherent worth and dignity of every person, and the respect for the interdependent web of all existence. In keeping with these beliefs, we affirm that tolerance and an understanding of perspectives and experiences is crucial to our wider community, and that exposure to a variety of perspectives should be a part of every child’s experience. Therefore, we resolve to promote the enactment of laws, policies, and practices at all levels of government that provide for all children quality education and the richness found in diverse schools and communities. BE IT FURTHER RESOLVED, that copies of this resolution be sent to all Wake County members of the General Assembly, the Speaker of the House, the President of the Senate and the Governor of North Carolina. We, the members of the Unitarian Universalist Fellowship of Raleigh, affirm the basic right of same-gender couples to marry and to share fully and equally in the rights, responsibilities, and commitments of civil marriage.